The JLCooper ion is an ultra-compact video switcher controller for live video production; provides hardware control of Blackmagic Design ATEM Live Production Switchers. 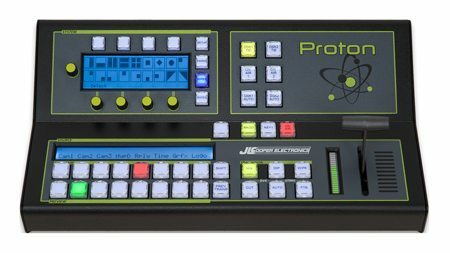 JLCooper’s Proton video switcher offers all the facilities of the ion in a larger control surface, plus a larger selection of wipe patterns, user-definable macros, a large multi-function control display and other features. The JLCooper ion is an ultra-compact but fully-featured hardware video switcher control surface which provides a tactile alternative to software control with a keyboard/mouse combination. The ion interfaces are directly compatible with the Blackmagic Design ATEM range of switchers. ion connects via Ethernet: with a network switch, a computer or Blackmagic Broadcast Panel running ATEM software can remain connected. Most of the switcher’s basic functions are accessible from ion, including source selection, wipes and cuts, and fade-to-black. The ion is compatible with the ATEM Production Studio 4K, ATEM 1 and 2 M/E Production Studio 4K, ATEM 1 and 2 M/E Production Switcher and ATEM Television Studio. ion is extremely compact: it may be used as a desktop unit or mounted in a 19” rack (rack ears available as an accessory). It uses large, illuminated push-buttons, which may have their legends customised. Button illumination and the brightness of the 2 x 40-character LCD display are user-adjustable, ideal when in use in low ambient lighting conditions. The Program and Preview buses each have eight source buttons; source labels appear immediately above, in the 2 x 40-character LCD display. The buttons automatically remap to match the number of inputs available in the switcher. Further buttons control the transitions, which may be either actioned manually with the precision T-bar, or automatically. The progress of both manual and automatic transitions are displayed on an LED bargraph. ion supports a “Host Mode”, allowing software developers to integrate it into larger, OEM systems. ion is powered from an external Universal PSU, supplied with the unit.